"Even when the powers of hell are unleashed, Christians must rise to the summons, their heads held high, and be ready to brave blows in this battle over which God will have the last word. 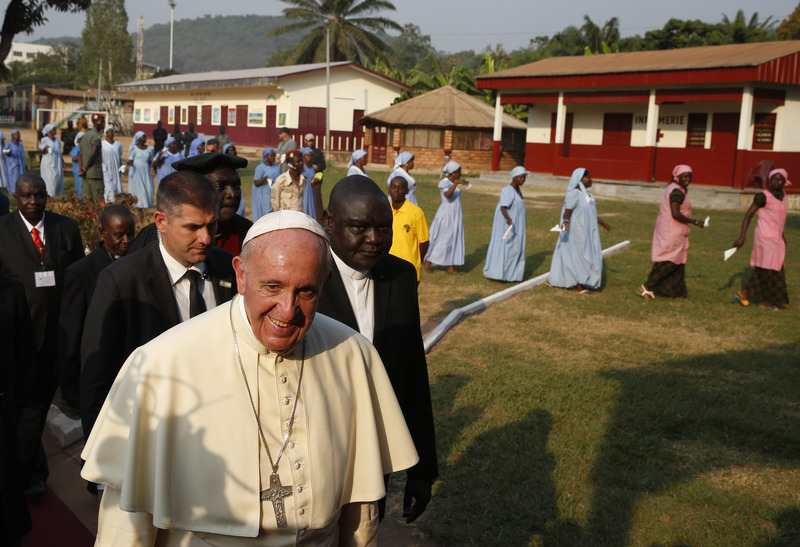 And that word will be love and peace," the pope said in an evening homily Nov. 29 at Bangui's cathedral. A civil war that began in 2013 and ongoing outbursts of violence, including between mainly Muslim and mainly Christian militias, have sown terror in the Central African Republic, which already was on most lists of the five poorest countries in Africa. A fifth of the country's population has fled abroad or is living in camps for displaced people. Explaining to people outside the Bangui cathedral that their city was, for the day, "the spiritual capital of the world," Pope Francis prayed for the mercy and grace of peace as he used both hands and his body weight to push open the Holy Door of the cathedral. The main opening of the Year of Mercy will be Dec. 8 at St. Peter's Basilica in Rome. Christians, and especially those with a vocation to priesthood or religious life, are called to love their enemies, "which protects us from the temptation to seek revenge and from the spiral of endless retaliation," the pope said in his homily. Anyone who has a role of evangelizer, teacher or preacher in the Christian community, he said, must be "first and foremost practitioners of forgiveness, specialists in reconciliation, experts in mercy." As Catholics observe the Advent time of waiting to celebrate Christ's coming, he said, they should keep reminding themselves that God is a God of justice and of love -- two things the people of Central African Republic need desperately. "God is stronger than all else," the pope said. "This conviction gives the believer serenity, courage and the strength to persevere in good amid the greatest hardships." "To all those who make unjust use of the weapons of this world, I make this appeal: Lay down these instruments of death! Arm yourselves instead with righteousness, with love and mercy, the authentic guarantors of peace," the pope said. Pope Francis arrived at the cathedral after a meeting with representatives of the Central African Republic's evangelical and Protestant communities. Catholic Archbishop Dieudonne Nzapalainga of Bangui, president of the Central African Republic bishops' conference, Rev. Nicolas Guerekoyame-Gbangou, president of the Evangelical Alliance of the Central African Republic, and Imam Oumar Kobine Layama, president of the Islamic Community of Central African Republic, have been working together to persuade their people to end the vendettas and embrace peace and reconciliation. Rev. Guerekoyame-Gbangou was among those welcoming Pope Francis Nov. 29 to a special meeting with representatives of the country's evangelical and Protestant communities. The pope publicly expressed "closeness and solidarity to Pastor Nicolas, whose home was recently ransacked and set on fire, as was the meeting-place of his community. In these difficult circumstances, the Lord keeps asking us to demonstrate to everyone his tenderness, compassion and mercy." "There are also those who have been scarred in soul or body by hatred and violence, those whom war has deprived of everything: work, home and loved ones," the pope said. When God looks upon the suffering, he does not see members of one denomination or another. "I have often called this the ecumenism of blood," he said. "All our communities suffer indiscriminately as a result of injustice and the blind hatred unleashed by the devil." Pope Francis urged the country's Christians to continue on the path of ecumenism, cooperation and common prayer. "The lack of unity among Christians is a scandal," he said, "above all because it is contrary to God's will." But it is also a scandal in a world torn apart by hatred and violence, a world yearning for a word of peace and unity, he said.